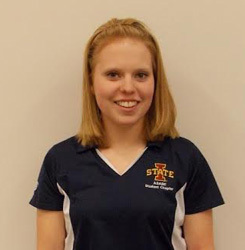 Kate Klavon—a senior in agricultural engineering—has always been interested in the environment, and her time at Iowa State has been devoted to preparing herself to find solutions to environmental problems. With the help of the Michael Allen Schultz Endowed Scholarship, Klavon has been able to pursue her interests in agriculture and the environment. She has also taken advantage of the College of Engineering’s various on-campus opportunities to gain real-world experience in her field. After two years in biosystems engineering, Klavon found she preferred the classes in the agricultural program and the projects agricultural engineers work on in industry. Still managing to graduate in four years, the switch didn’t hold her back or prevent her from staying active in student groups. Klavon has been a member of the American Society of Agricultural and Biological Engineers (ASABE) since she was a freshman. She currently serves as the historian and previously held positions as secretary and club president. Klavon also acted as a Cyclone Aid and was involved with the Engineering Ambassador and Mentor Program, which organizes campus tours and events for potential students, visitors and employers. Aside from taking classes, during the fall 2013 semester she worked at the USDA branch on campus and applied for graduate school at Oklahoma State and the University of Wisconsin–Madison. Klavon will graduate in the spring and plans to work with the USDA at Iowa State throughout her final semester and potentially in the summer. Originally from Cedar Rapids, Iowa, Klavon said she isn’t picky about where her career might take her, but she does have some specific interests in what she’d like to do once she starts working. “Ultimately I’d love to find some solution that can solve the nutrient runoff problem in agriculture,” she said. “I became interested in agricultural engineering because of the Dead Zone in Mexico, and a lot of that is caused from the pollutants that come from Iowa because we tile-drain all of our croplands. The Michael Allen Schultz Endowed Scholarship was created in 2012, and recipients must have at least a 3.5 GPA and a demonstrated interest in preserving and protecting the country’s natural resources. The fund honors Iowa State alumnus Michael Schultz, who earned a bachelor’s degree in agricultural engineering in 1980 and a master’s in engineering from Purdue University in 1982. Schultz, born in Fairfield, IA, worked as a certified professional engineer from 1989 until he died in an accident at age 53. In 1991, he accepted the position as a project manager in the Jacksonville Florida District of the U.S. Army Corps of Engineers, where he worked for 20 years to preserve and protect our country’s natural resources. “Because of his superior and continuous level of quality service to the nation, Mike was recognized by the U.S. Environmental Protection Agency with the National Project Leadership Award in 2009 and 2010,” wrote his wife Susan Schultz in a news release to announce the scholarship.